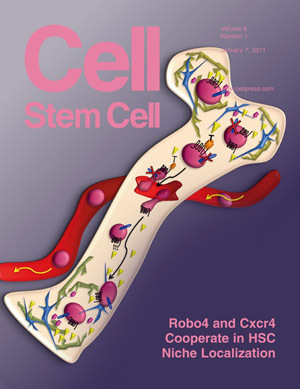 The cover image of the current issue of Cell Stem Cell depicts the findings of UCSC researchers on molecules that regulate the movement of hematopoietic stem cells between the blood stream and bone marrow. Stephanie Smith-Berdan, a research specialist in Forsberg's lab, is first author of the new paper. Coauthors include UCSC researchers Andrew Nguyen, Deena Hassanein, Matthew Zimmer, Fernando Ugarte, and Lindsay Hinck, professor of molecular, cell and developmental biology; Dean Li of the University of Utah; and Jesus Ciriza and Marcos Garcia-Ojeida of UC Merced. This work was funded by UCSC and the California Institute for Regenerative Medicine.